Alexander Velazquez, M.D. joined IDC in 2011. He received his medical degree from Ross University School of Medicine, Portsmouth Campus, Roseau, Commonwealth of Dominica, West Indies; trained for Internal Medicine and Fellowship in Infectious Diseases at Orlando Regional Healthcare, Orlando, FL. 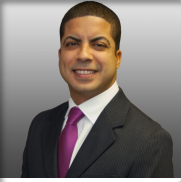 Dr. Velazquez is Board Certified in Infectious Diseases. He is a member of the American College of Physicians, the Infectious Disease Society of America and the Florida Infectious Disease Society.